What do you love best about Dublin’s food scene? There are some very good restaurants in Dublin now, an immense diversity of cooking styles and flavors housed in very interesting buildings throughout the city. Name the top restaurants that you think every visitor to Dublin should try. Some of my favorites include 777, Chapter One, Paulie’s, The Greenhouse, [and] Kinara Kitchen. I visit Arizona on a regular basis to see family and friends and have a real passion for the Southwest and Mexican style cooking. My wife and I enjoy 777, which is a Mexican restaurant in the city center serving high-end tacos with good ingredients. Chapter One [is] a little off the beaten track but a must on your dining bucket list for the best of Irish food cooked to a Michelin star level. We are lucky to have what I consider the best pizza restaurant right across the street from us. Paulie’s does the best sourdough pizza bases with excellent toppings sympathetic to both Italy and New York. The Greenhouse on Dawson Street under the command of Mickael Viljanen has to be one of the best restaurants for that special occasion. The flavors, the food combinations … sublime! Indian cuisine from Kinara Kitchen in Ranelagh has to be one of the best Indian restaurants in the city. Specializing in traditional dishes from Pakistan and serving delicious cocktails in a secret vintage-style cocktail bar on the first floor. Smoked salmon sandwich from The Chop House. Photo credit: Stephen Tang. If you were to ask me about my favorite neighborhood in Dublin, I wouldn’t go much further than my own here in Beggars Bush. It has become the hippest eating/drinking area in the city over the past 3-5 years because of the array of eateries and bars that have opened. Describe your “perfect dining out day” in Dublin. 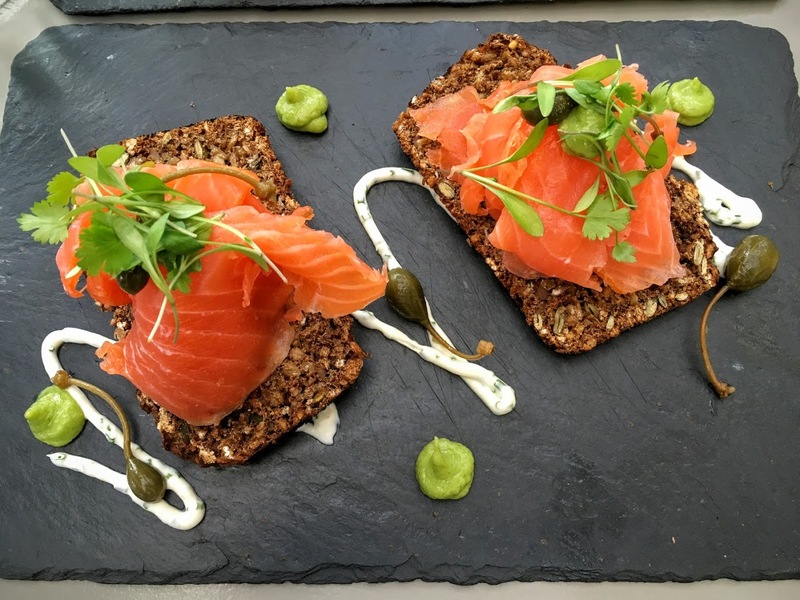 Breakfast in The Shelbourne Hotel – scrambled eggs with smoked Irish salmon. Lunch in Restaurant Patrick Guilbaud. Pre-dinner drinks on the Rooftop Bar of the Marker Hotel. Cheeseboard in The French Paradox. What’s your favorite personal dish at The Chop House? My favorite dish at The Chop House is our 32-day dry Hereford prime sirloin cooked medium rare, served with our spicy prawns and twice-cooked chips! Delicious! What’s one dish in Dublin that blew you away and left you wishing you came up with the recipe yourself? The passionfruit soufflé in The Greenhouse with white chocolate sauce – sublime! 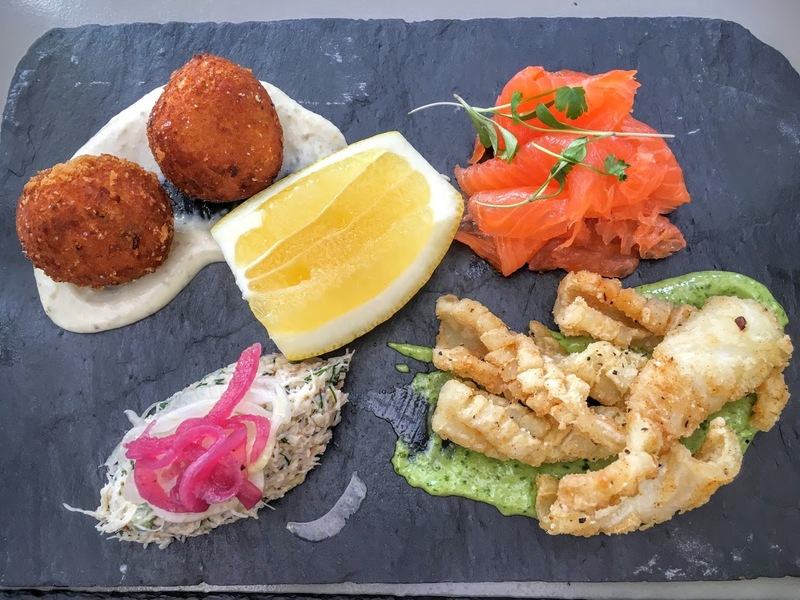 Fish board from The Chop House. Photo credit: Stephen Tang. Since it’s Dublin, we have to ask: where do you go for the best coddle and what makes it so good? Dublin coddle is a rare dish to find served. To eat the best, travel to Glasnevin to The Gravediggers, where you will find a very warm welcome and a delicious bowl of coddle. My guilty pleasure would be the tacos in 777 restaurant, washed down by a very good house marguerite. Since this is a site geared for travelers, are there any favorite restaurants or bars at Dublin Airport or in the city’s hotels that you particularly enjoy visiting? The hotel restaurant would be Patrick Guilbaud’s at The Merrion Hotel. For a truly great cocktail, try Angelina’s or the speakeasy at Kinara Kitchen! A joy to the palate! Are there any snacks or foods native to Dublin that you particularly like and that visitors should seek out? For a great pint in true Dublin style, I love to stroll to Toners of Baggot Street, an institution in the city since 1818. The best pint of Guinness! What would you say every visitor must see or do before leaving Dublin? All visitors to the city should go on the Viking Splash Tour. You will enjoy full witty commentary about our city as you drive around and get ready for a splash in the canal basin at the end. Unique! The Chop House, 2 Shelbourne Road; gastro pub, lunch Monday-Friday, dinner Monday-Saturday, bar only Sunday. 777, 7 Castle House, S Great George’s Street; Mexican, dinner only daily. Chapter One, 18-19 Parnell Square N; Irish, lunch Tuesday-Friday, dinner Tuesday-Saturday, closed Sunday-Monday. Paulie’s Pizza, 58 Upper Grand Canal Street; Neapolitan pizza, dinner only daily. The Greenhouse, Dawson Street, off St. Stephen’s Green; modern, lunch and dinner Tuesday-Saturday, closed Sunday-Monday. Kinara Kitchen, 17 Ranelagh Village; Pakistani, lunch Thursday-Friday and Sunday, dinner daily. The Shelbourne, 27 St. Stephen’s Green; international, breakfast, lunch and dinner daily. Restaurant Patrick Guilbaud, Merrion Hotel, 21 Upper Merrion Street; contemporary Irish, lunch and dinner Tuesday-Saturday, closed Sunday-Monday. Rooftop Bar and Terrace, The Marker Hotel, Grand Canal Square; bar, open hours vary. The French Paradox, 53 Shelbourne Road; wine shop and bar, open Monday-Saturday, closed Sunday. John Kavanagh “The Gravediggers,” 1 Prospect Square; Irish, lunch and dinner daily. Angelina’s, 55 Percy Place; Italian/deli/bar, lunch Monday-Friday, brunch Saturday-Sunday, dinner daily. Toners, 139 Lower Baggot Street; Irish pub, lunch and dinner daily. Viking Splash, St. Stephen’s Green North; land and water city tour, operates daily. About the Chef: Chef Kevin Arundel opened his gastro pub The Chop House in December 2009, and to this day, no other restaurant in Dublin has the unique selling point that his restaurant has. His formula paid off. In 2011, The Chop House was featured on Anthony Bourdain’s “The Layover,” where the host proclaimed the best meal he ever had in Dublin was from Chef Kevin’s restaurant. The following year, The Chop House was named Best Gastro Pub in the country by the Irish Restaurant Awards for the first time. Today, the restaurant continues to thrive, especially as a destination for top quality Irish beef.